Vinca Minor Bowles Variety is a lesser vigorous growing variety of Vinca that features larger leaves and flowers in more numbers. It is an evergreen low-growing plant that spreads instead of rising high and is suitable for groundcover. Also known as Creeping Myrtle or Lesser Periwinkle, this perennial creates a dense mat of dark green leaves, decorated with bright azure-blue flowers. Its trailing stems will quickly spread as soon as they touch any bare ground. Bowles Variety produces large ovate, dark green glossy leaves that will add year-round interest in your garden. Throughout the spring and sporadically in summer to autumn, the plant will bloom 5 petaled pinwheel-shaped flowers that are rich azure-blue in colour. These flowers really standout appearing bright as they contrast against the lustrous foliage. Vinca Minor is a lesser vigorous grower and less invasive in nature. 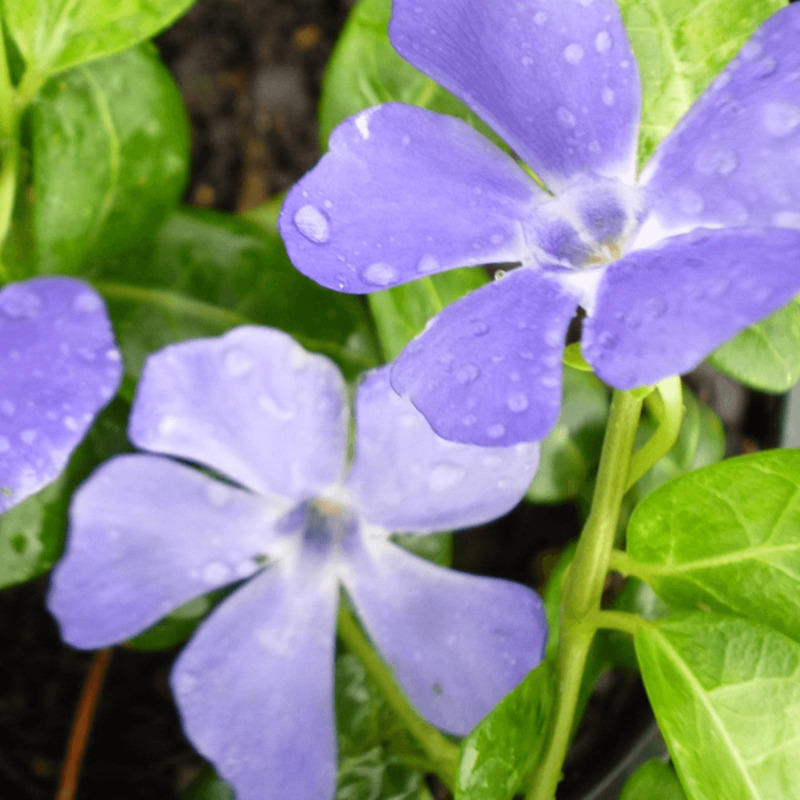 This Lesser Periwinkle is shade tolerant and prefers shady spots but it can grow well even on sunny slopes. It will thrive in any soil that is moist and well-drained. Its roots strictly dislike dry soil and prefer damp areas of a garden. The leaves of Vinca Minor are prone to scorching in hot sun. It is an easy to grow plant that will cope with neglect and thrive on its own, once it is established. Water the new plants well and they can be easily relocated too. Its compact growing habit will save you from excessive pruning efforts. Simply use a mower to cut back hard in spring, to give it a tidy shape, but only after the flowering. Vinca Minor Bowles Variety makes attractive groundcover and is perfect for suppressing weeds. Use it on sunny slopes and banks where it will also help in controlling soil erosion. The trailing habit of this wonderful plant make it look lovely in a hanging basket.